The biggest resistance to developing an online presence among dental practices has been the fear of negative publicity, comments and reviews. The reality is that having a strong web presence and knowing how to play the game is the best way dentists can ensure that the image of their practice portrayed online is accurate and positive. For many years dentists were able to ignore aspects of their practice and policies toward patients and staff that were less than friendly but the Internet has changed all that. Anyone who feels wronged now has the ability to broadcast their displeasure, whether on the office social media page or via a review on Google, Yelp or any number of other places online. One of the major influences the Internet has had on our lives today is the ability it gives people to share their experiences with not only their friends, but also complete strangers. It makes us accountable in a way we have never been before. Yet not only do dental practices need to be wary of negative publicity, they need to learn how to harness the power of the sharing economy1 to their advantage, to emphasize the positive things they do, to encourage satisfied customers to be missionaries for the growth of the business, and generally to make sure the online image or electronic reputation of the business mirrors or enhances the vision and goals the business has created. In a perfect world, the Internet would reflect reality, so the challenge for business owners is to make sure that ideal exists as it pertains to their businesses. The biggest problem that dentists face is that the largest preponderance of reviews about businesses online are for the nightlife and hospitality industries (restaurants, movies, music, etc.). References to dentistry, both online and in the real world, have always emphasized the negative experience, with having a tooth pulled or a root canal performed being cateby gorized as among the worst experiences in life. The few who have bad experiences are known to complain or discuss it publicly, whereas no one has ever heard anyone say, “I just had a great root canal!” Likewise, a dental patient is more apt to write a negative or bashing review on a website than one that praises his dentist or positive experience at a dental office. Craigslist is one place where people are solicited to write reviews without ever knowing a business, for a fee, of course. There are even reports of businesses incentivizing individuals to write negative reviews about competitors. The Yelp representative acknowledged the issue but explained that Yelp has developed a sophisticated algorithm to weed out bogus reviews and that 75 percent of reviews make “recommended” status. A review can also be labeled as non-recommended if the algorithm detects a pattern that would indicate that the review was forced or unnaturally coerced. If a dental office all of a sudden starts asking their patients to write positive reviews on Yelp, even if the reviews are genuine and heartfelt, the Yelp algorithm will note for example, that in one week Dr. Smith’s office got five Yelp reviews where they previously had only one or two in the preceding six months. Yelp wants the reviews to be consumer driven and random, without coercion. Another example of how its algorithm detects bogus reviews is through a computer’s identification or IP address, which is unique for each computer. A professional review writer might set up multiple Yelp accounts on the same computer to disguise his identity when he attempts to write multiple reviews for the same business. Since the different accounts would come from the same IP address, any reviews from that computer would be rejected. So, how should a dentist use Yelp properly? The Yelp spokesperson who I recently interviewed recommended that offices place a decal that is visible at their place of business encouraging consumers to “find us on Yelp.” In so doing, more patients will notice the decal and consider writing a review on Yelp. This should create an evenly spaced submission pattern and shouldn’t be rejected by the algorithm. Another suggestion Yelp has is to run a check-in promotion at the office in which a patient gets some sort of product incentive to let Yelp know they have visited your office. Yelp would then follow up by asking them to rate the business with a high likelihood of being published. Facebook has also started a review system based on a star rating that appears prominently below the cover photo on a business page. Businesses can encourage their fans to post a review and the posters can select a privacy rating of friends, public or complete privacy to determine if the rating and any comments are viewable. The star rating is factored into that pages’ rating on Facebook. Like Yelp, Facebook will also message users who have checked in to a business and ask them to rate the business. On Facebook, businesses do have the ability to remove a review from being viewed in the review box, but cannot delete the rating imparted by the user. Google may offer the biggest incentive for a business to request reviews from a Google+ page. The limitation of asking patients to review your business on Google is that they must have a Google+ account to do so. Google+ also prohibits anonymous reviews to encourage authenticity and publishes a business’ Google+ star rating on their search results page. Since Google is far and away the most popular search engine, having a fouror five-star rating viewable on search results will increase the likelihood of potential customers clicking on the link to that business. Conversely, having a lower rating is a reputation disaster. There are a large number of other dental review sites that consumers can both post to and review ratings of dentists on. Healthgrades, Vitals, Doctoroogle, Citysearch, Angie’s List, Rankmydentist and RateMDs are just some of the many sites. Some are free services that rely on advertising for their funding, while others require paid membership from providers, members or both. A dentist’s reputation can be attacked with negative reviews from any of these sites and if the idea of monitoring them all seems daunting, relax knowing that there is help available from some fine products in the marketplace. Reputation.com has two products: Reputation Defender and Reputation for Business. I learned about this company in 2010 when I had a personal battle with identity theft and have found the services invaluable. 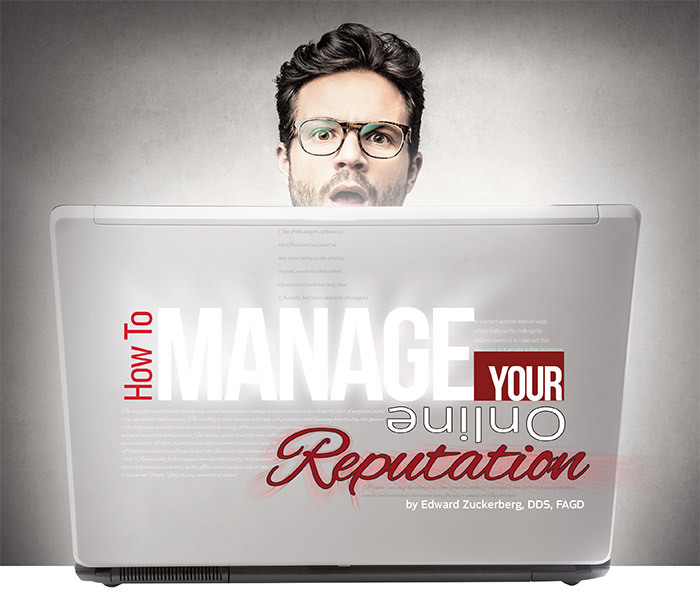 Reputation for Business is a fully managed personal service that monitors all known review sites and responds quickly to any negative reviews to preserve a dentists’ reputation. They recently became integrated with Henry Schein via the Dentrix Developer Program and are sold through the Dentrix Marketplace. They offer a unique kiosk program that integrates with Dentrix — tablets are provided to patients in the office while the experience is still fresh. Negative reviews are routed back to the office for review while positive ones are posted directly online. The platform uses the Dentrix integration to solicit patients to review the practice online and then routes the reviews to the sites that require reputation enhancement the most. They also provide a place for dentists to view all their reviews in one location and get notified when a new review is placed on any of the major review sites. The software is also available as a stand-alone system and has plans to integrate soon with Eaglesoft and other practice management systems. Another valuable tool is the Social Beacon offered by Einstein Medical. Einstein has been around since 1995 as a leading provider of Internet marketing for cash-pay health-care practices. Their proprietary DocShop directory connects patients to specialty medical and dental offices and they also create exceptional websites (including mine, www.painlessdrz.com). Their newly rolled out Social Beacon allows a dentists’ patients to review the practice right on the office website. The application then takes four- and five-star reviews and allows the office to select which review site to post it to. Monitoring all the review sites allows an office to determine which sites might need a boost in ratings and the office can alternate or pick the sites they wish reviews to post to. In the event that a user places a review of three stars or less, something very interesting happens. A pop up questionnaire asks about the user experience including a field for additional comments. After submitting the review and receiving an acknowledgement, the review is then sent to the office instead of being published online. The office personnel can then view the middling to negative review and use the information to attempt to improve the relationship with the patient or to evaluate systems in place for improvement. Those screened reviews never get published online. This is a handy little tool that can help improve the care and customer service offered, as often the dentist and staff do not realize the behaviors and policies that tick off some patients. There are valuable lessons learned from less-than-positive reviews and often these situations present an opportunity to salvage a potentially lost patient relationship. I often get asked at my lectures how to respond to negative posts on my office Facebook Page. This is a unique type of negative review or comment because Facebook permits the administrator to delete any comments posted to their page. But in most cases I believe this is a missed opportunity. A negative post by a known individual who is not hiding behind a fictitious name is a cry for justice by someone who feels wronged. I cite an example of a patient who complained about having to wait more than 30 minutes for an appointment in a post on my Facebook Page. I examined the schedule for the day and recalled that we were set behind with an avulsed tooth emergency requiring immediate re-implantation. I addressed the negative post right on Facebook disclosing the reason for the unexpected wait and apologized that we had not been diligent in informing him the reason for the delay and offering to reschedule. What happened next surprised even me. Many other patients who were Facebook fans of the page chirped in with comments ranging from testimonials to many years as a patient and not having to ever wait more than five or 10 minutes to patients commenting on how amazing it is that we can re-implant an avulsed tooth. The end result was a very positive chain and a salvaged patient. This example shows how a dental office can and should be proactive with reviews, both positive and negative. Thank patients for positive ones and address the negatives where appropriate. It takes many years of hard work to establish a positive reputation. It’s worth the time and expense to preserve it when the Internet has made it so easy for alienated patients and staff members to gripe. The Internet is not going away so dentists are wise to embrace it, learn as much as they can about it and utilize the services of professionals to support our reputations. Dr. Edward J. Zuckerberg is a 1978 Graduate of NYU College of Dentistry. He owned his own practice in Dobbs Ferry, New York, from 1981- 2013, and has always been an early adopter of technology. Dr. Zuckerberg now regularly lectures nationally and internationally on technology integration and social media marketing for dentists in addition to treating patients part time in Palo Alto, California. He maintains a Facebook page, www.facebook.com/painlesssocialmedia with tips for his colleagues on promoting their practices using social media to attract new patients and maintain and improve relationships with existing ones, as well as a page for his patients, www.facebook.com/painlessdrz.